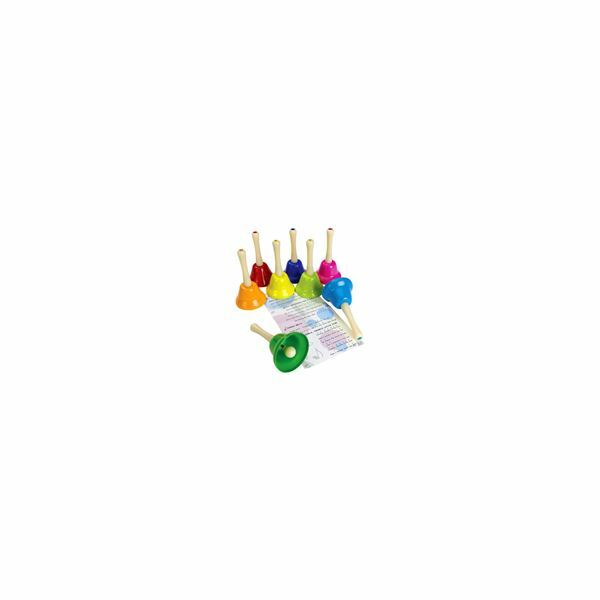 These musical hand bells are simple and easy to use. They come with sheet music and are color coded and coded with the musical key (letter). The musical key (letter) can also be found on the handle of the bell. Each bell has a different tone and when the directions are followed, you can actually play a whole song with them. Sheet music that is included: Twinkle, Twinkle, Little Star, Jingle Bells, Old MacDonald Had a Farm, Joy to the World, Row, Row, Row Your Boat, Jingle Bells, London Bridges, Lullaby and Mary Had a Little Lamb. Although the price is a little high, it is a valuable purchase as teachers can use the bells year after year. The bells can be used in several ways. I have used them when teaching nursery rhymes to extend the learning. I have written some lessons using nursery rhymes Mary Had a Little Lamb and Twinkle, Twinkle, Little Star. These two nursery songs are included in the musical hand bells kit. Use Old MacDonald Had a Farm when teaching about a farm and cardinal directions. Use the bells during holiday time to teach students how to play the song, Jingle Bells for a Christmas musical or just for fun. Use at a music center- but teach proper use of the bells before letting the student use them independently. Also, laminate the music sheets. Double the fun by getting the Learning Resources, Melody Express Musical Train. This is also made to teach children coordination between music notes and colors. This is advice from personal experience; get these bells, because your Kindergarten or Preschool students will love this activity. It will especially benefit the musical learners. I also found that students with special needs really enjoyed this musical experience. It took some tension away from the instruction and just brought enjoyment to the lessons, which actually promoted the learning. Photo is of the actual product.